It's been awhile since Raikkonen made it to the podium. The Finn finished third in the Bahrain Grand Prix, having started ninth! Incredible! 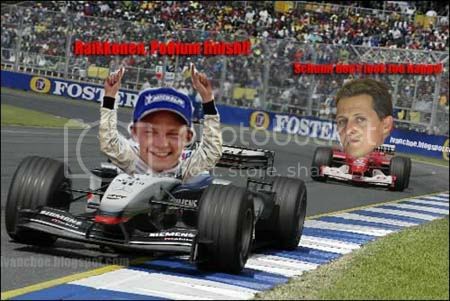 :) To make the victory sweeter, the 2004 constructor's champion, Ferrari did not obtain any championship points from this race! muahahahaha! Click Here! for my analysis on the Bahrain GP.